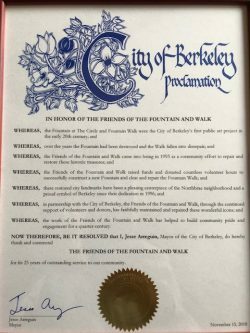 On Thursday, Nov. 15, Friends of the Fountain and Walk marked its 25th anniversary as a community service group with a celebration at Berkeley’s Hillside Club. 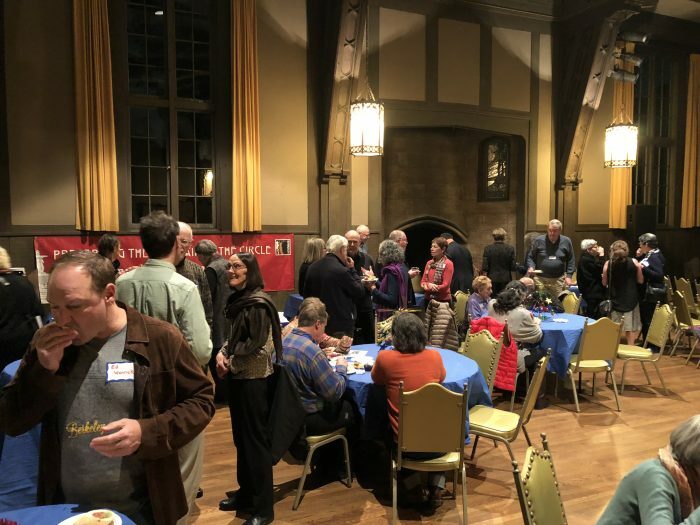 The evening was a chance to say thank you to our community – which includes volunteers, donors and just plain “Friends” – for generous support over all those years. 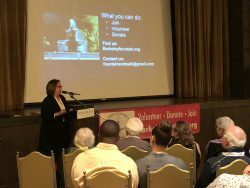 About 80 people braved the smoky air to join us for food and drink and a short program that reviewed the history of both the Fountain at The Circle and Fountain Walk and our all-volunteer neighborhood nonprofit. The evening was made possible with the support of several local businesses, especially Marvin Gardens Real Estate, HK Fitness and Molly Mutt. Food and wine were donated by Rock Wall Wine Company, The Cheese Board Collective and Saul’s Deli. Safeway Community Market on Solano Avenue also provided a discount on its catering. The gathering was highlighted by the presence of several of the “pioneers” of FOFW – the people who first envisioned and then carried out the plan to re-create the fountain (the 1911 original had been destroyed in a crash decades earlier) and to restore Fountain Walk. They included: Phil and Barbara O’Hay, Emmy Sortor, Linda and Tim Perry, Gerry Tierney, Sarita Waite, Trish Hawthorne, Shirley Dean and Sara and Harvard Holmes. Also on hand was District 5 City Councilmember Sophie Hahn, who presented the FOFW board with a city proclamation signed by Mayor Jesse Arreguin honoring the group for its 25 years of service. The event also offered a glimpse at another Berkeley group aiming to restore a city fountain: The Turtle Island Fountain Project has plans to revitalize the long-dry fountain in Civic Center Park, an effort that stalled in 2005 and has regained momentum in recent times. FOFW thanks all of those who came out for this celebration, as well as hundreds of other supporters who could not make it but whose contributions of time and financial help are what make FOFW successful, and will help ensure another 25 years of service to our community.